The first LiMovie plot shown above was taken over the entire graze period from start to finish. There are several events at the start of the graze, followed by one minute and twenty seconds during which El Nath is occulted by the moon, followed by several events at the end of the graze. Lets look at the start of the graze in more detail. As we can see above we have two events at the start. The first event could either be called a "Blink" or could be separated into a "Partial Disappearance" followed by a "Reappearance". 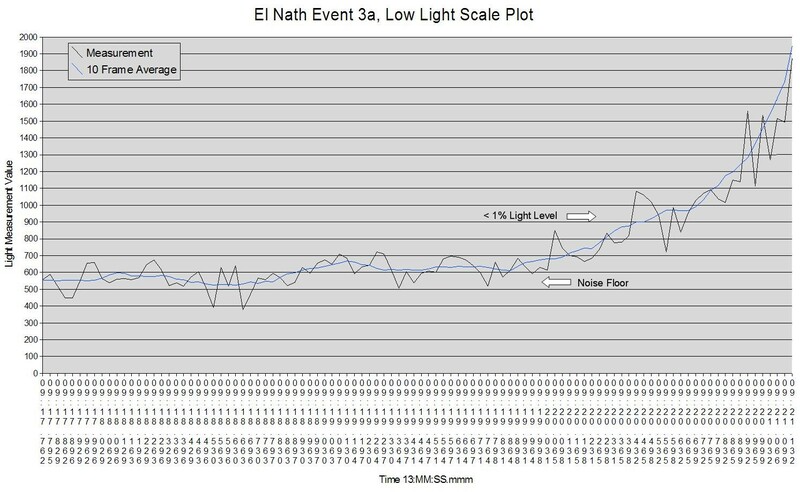 Either way, the light level of El Nath fell by a little over 50%. The second event is a full disappearance. At first glance, Event #2 appears abrupt, but the video shows that after this event, a small amount of light lingered for a couple seconds afterward. A second plot had to be taken which could show the lower light level. For the plot above, LiMovie was optimized to detect small changes in low light levels. 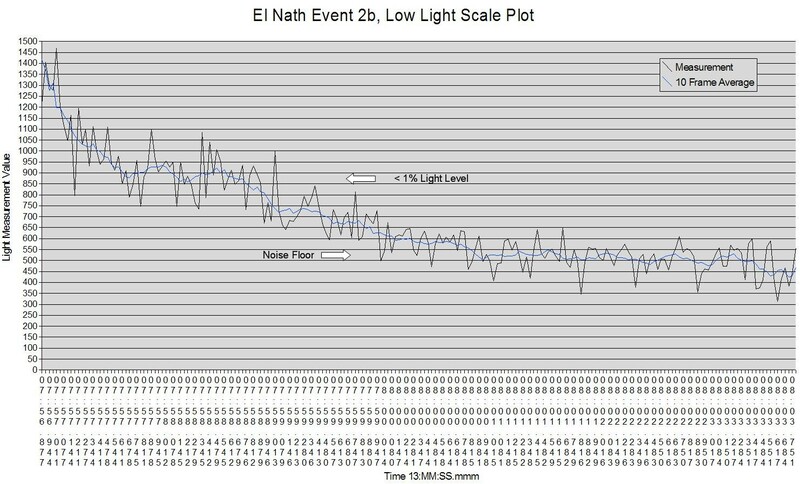 This causes El Nath's Full light level to become saturated during the measurement, but for now, we only care about the end of Event 2, where the light level is low. As we can see now, there is a step event which lasts approximately two seconds at the end of Event 2. 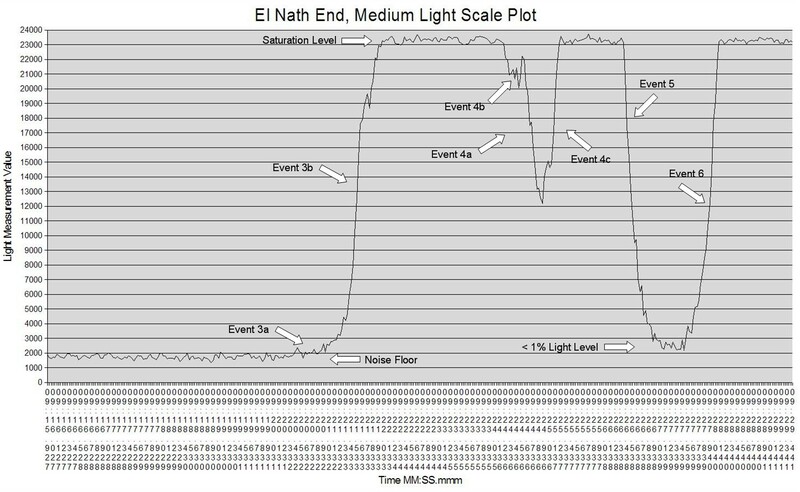 We now separate Event 2 into two parts, Event 2a, the Disappearance, and Event 2b, the low light level step event. For additional detail, one more plot was taken at an even lower light level. With the above plot it is easy to distinguish between the noise floor and the low light level. 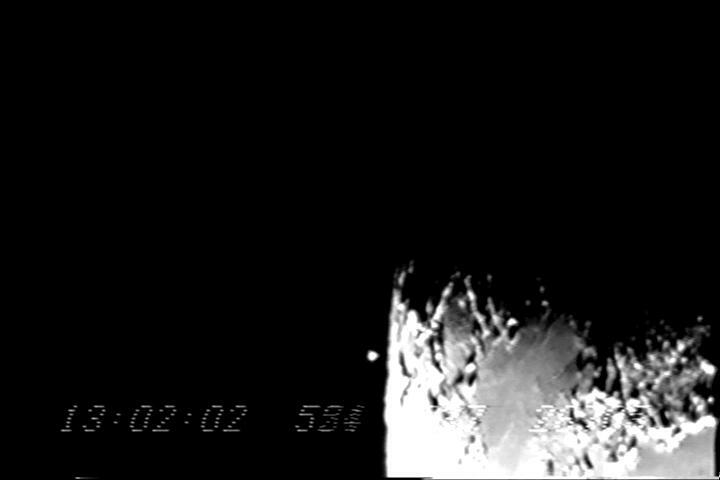 The following snapshot was taken from the LiMovie software at time 13:07:58.145 which also shows the low light level. Lets move on to the end graze events. The end graze has four more events. 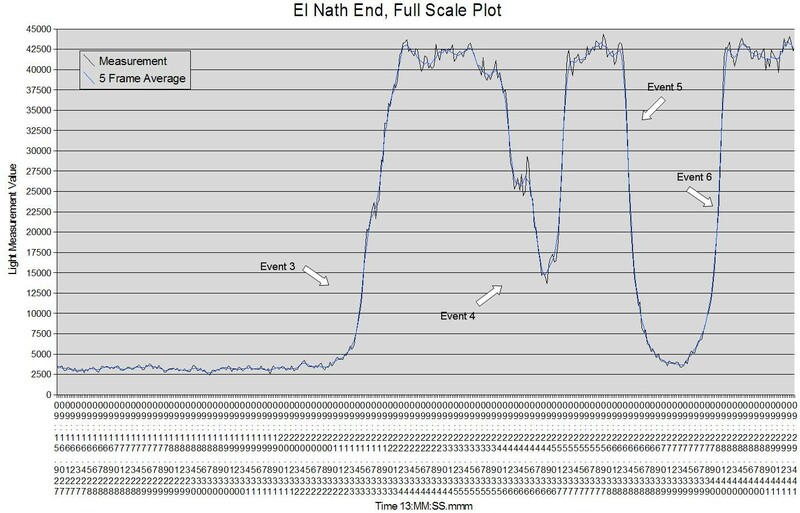 Event 3, a reappearance; Event 4, a partial disappearance to approximately 30% light level, which appears to include a step event as well, followed by a reappearance; Event 5 a full disappearance and finally Event 6 the last reappearance. Once again, lets take another plot which can show us the lower light levels. From the video and the above plot, it looks like Event 3 was a gradual reappearance. In fact the same low light level present for Event 2 was also present for Event 3, but for a shorter duration. It could be argued that this is in fact a single gradual reappearance event, but I decided to separate it into Event 3a, a low light step event, followed by Event 3b, a reappearance. The detailed plot and LiMovie snapshot for Event 3a is show below. Event 4 can now be separated into Event 4a, a partial disappearance, Event 4b a step event at approximately 50% light level, and Event 4c, the reappearance. 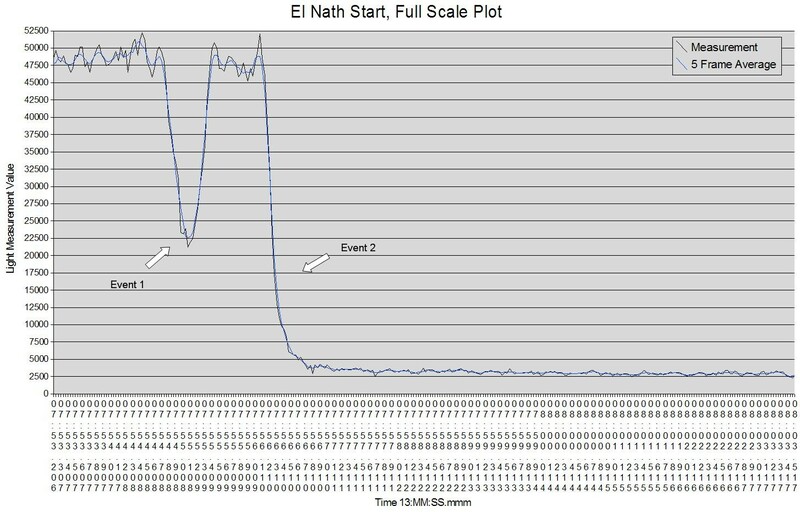 It is also clear from the video and the above plot, that El Nath did not disappear completely during Event 5, but only to a low light level step event. 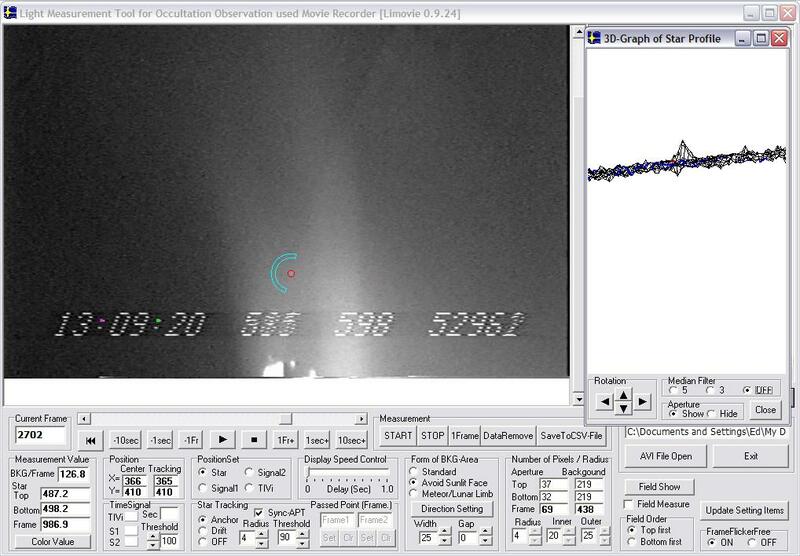 In the above plot the low light level is not as steady state as in Event 2b as its duration is less than one second. The following LiMovie snapshot is at time 13:09:20.598. 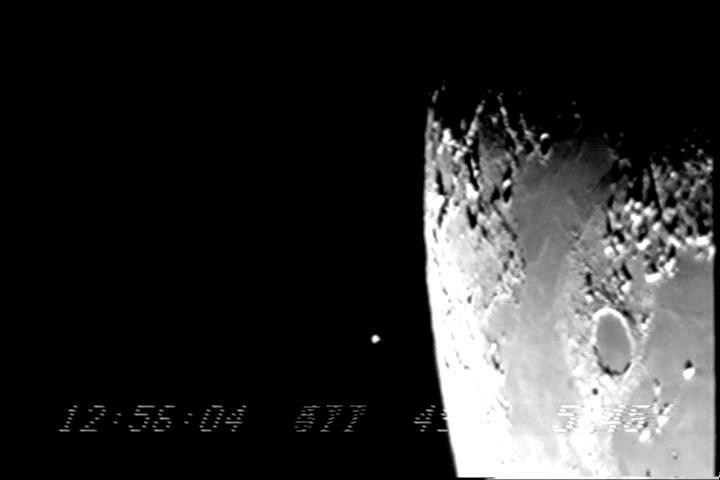 Another LiMovie snapshot at time 13:09:27.205, which shows the low light level between Event 5, disappearance and Event 6 reappearance. So what does this all mean? Clearly the data shows there are multiple steady state light levels to this graze. 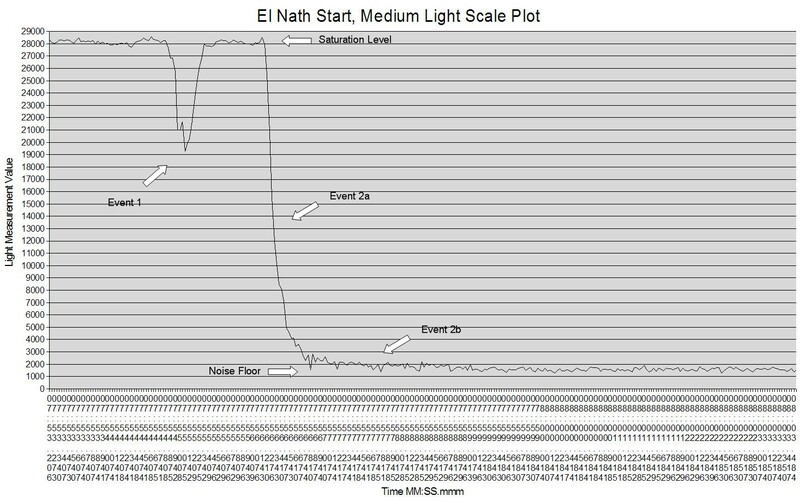 One explanation for prolonged step events at various light levels could be diffraction effects of El Nath as it passes just below areas of extremely flat terrain of the lunar surface. El Nath's large stellar diameter could also account for some of the events. 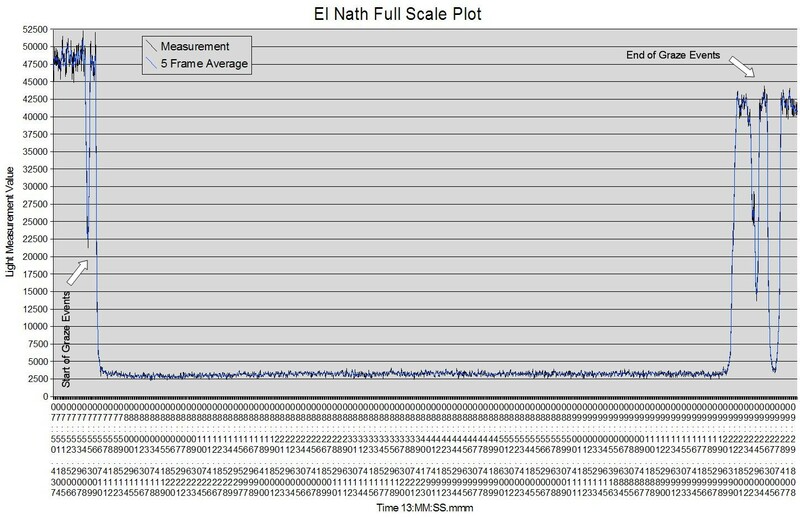 Another explanation could be that El Nath contains multiple star components. In order to answer this question with a degree of certainty, additional data must be gathered which can be used to either reject or confirm El Nath's multiplicity.